Being an artist I'm always on the lookout for new and interesting ways to display artwork. In this series once a month or so I will share with you 8 of my current favorite art walls. Inspiration comes from a Pinterest board I've created called "Art on Walls"
Apartment Therapy Messy cool bohemian kitchen with artwork hanging on a pink wall! Awesome! Elle Decor Notice the uneven spacing between each picture frame. Curate This Space This wall has a natural history theme to it. Apartment Therapy Huge gold framed print over the bed makes quite a statement. 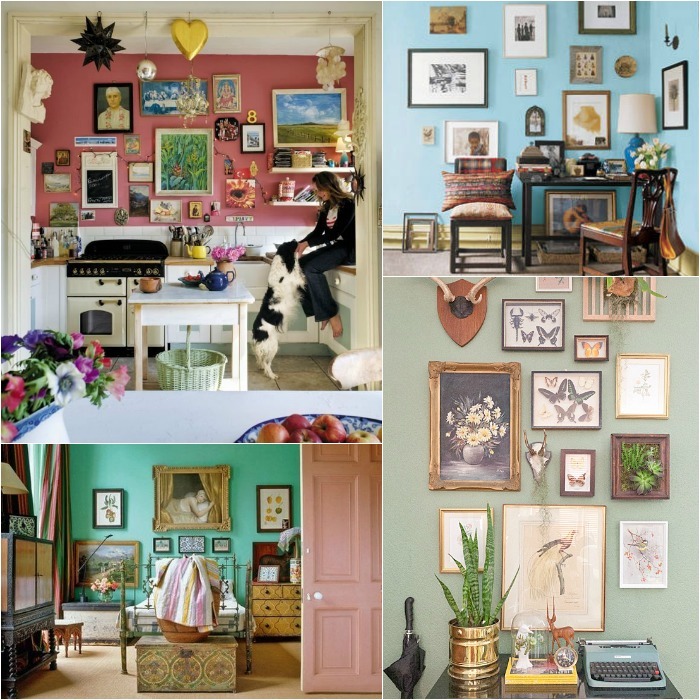 Elle Decor Create a gallery in a corner. Anthropologie No need to hang your work of art, just lean it up against the wall next to a bookshelf.